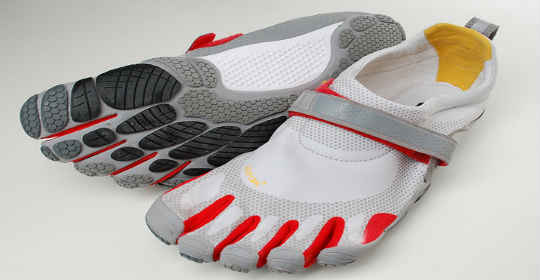 Vibrams are said to be a better and ergonomically correct shoe for running and other types of physical activity. The way it allows for each of your toes to wiggle and move, is meant to create less stress and tension on your feet, which means less room for injury. There are various models, each meant for a different sport. They are also built specifically for either men or women, and come in different styles and colors. The soles have a slip-proof grip, And are made from breathable mesh and Stretch nylon.Â You can customize and lock the fit, so they are specifically designed for you. These shoes are meant to be more efficient during fitness, but I think they look like you’re wearing a sturdy version of those funky toe-socks. it will probably take you time to get used to the wear and feel of these shoes, but they are said to improve your range of motion, flexibility and balance. I wasn’t too impressed when I first saw these shoes, possibly due to their design, though I wouldn’t mind putting regular sneakers and vibrams to a better workout shoe challenge. Check out this field test video to see Vibrams in action and the effect they have on your feet as well as overall performance. What about you?! Do you like the design and promise Vibrams offer? Or do you think they just look too weird when worn?! If you have a pair share your thoughts below! Do Vibrams really deliver a more vibrant fit and feel on your feet?! I personally think the vibram four fingers look ugly… But I’m sure they are better for your feet than 6 inch heels ;)Â I might have to buy a pair for my husband he likes weird looking shoes already! It’s a parkour apparel too. 🙂 it’s pretty sticky and pretty handy on your foot. lol. also it has medicinal massage thing.